Day 27 of the 30 Paintings in 30 Days found me back playing with toys again! This time the painting is "Lego, Limes,and Lamp Light". The Lego was from my sons childhood collection and the lamp is an old lamp base that came from my Grandma. I had fun trying to create the feeling of light in the scene from the lamp. There is an upper light and a lower light on this lamp. The Lego was actually pretty easy to paint. They are made of bright colors and only took a few strokes of paint to create the shapes and shadows. 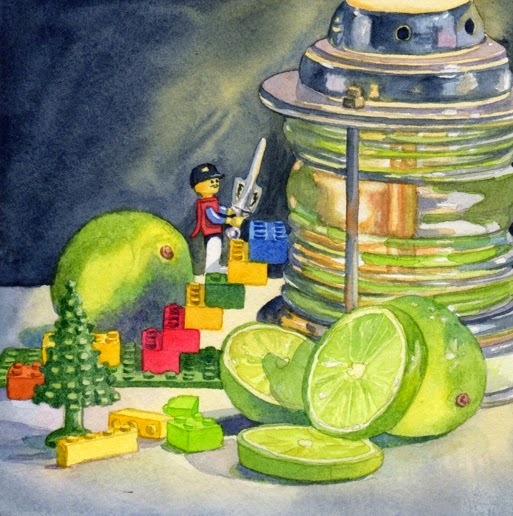 "Lego, Limes, and Lamp Light" is a 6"x6" watercolor available for purchase on Daily Paintworks for $150 (framed). Click here to purchase.